Navy Captain Pete Adler has finally attained his goals. 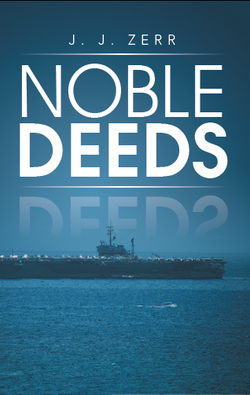 As he arrives at San Diego harbor and bids his wife farewell, he feels the familiar magnetic pull of the ship tugging him toward his greatest naval adventure. Pete is more than ready to take over as the commanding officer of the USS Marianas. As he boards the aircraft carrier and heads for the pilothouse, Pete battles a mixture of emotions that range from pride to trepidation—all while secretly hoping he can finally leave the ghost of his father’s disapproval behind. Pete, known for trusting his crew more than other commanders, relies on his twenty-eight years of navy experience to guide the ship out of the harbor and into the open seas. But just as the ship’s speed reaches twenty-two knots, an alarm goes off, alerting Pete to a fire in an engine room. As the massive fire intensifies, Pete attempts to lead his five-thousand-man crew, despite being haunted by horrific childhood memories and fears that his job is in jeopardy. Just when he thinks things cannot get any worse, Pete is hit with another blow—his father is dead. In this fast-paced naval adventure, one man takes an emotional journey from the present to his past, where he uncovers surprising truths about the pop he thought he knew.